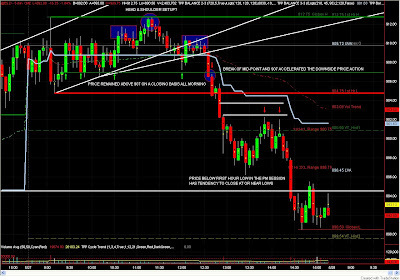 E-Mini Player: EMini S&P 500 Futures Trading Education and Analysis: Wed. 05/27/09 - Chop chop, break! Lot of econ news out tomorrow. Durable Goods Orders and Jobless Claims at 7:30 AM (central), New Home Sales at 9:00 AM. ES (Daily) - Bears can't get overly excited based on today's action since price simply pulled back to yesterday's 50% level. 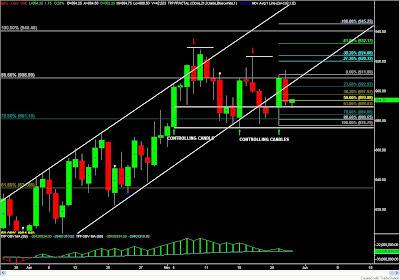 I'm sticking with Bullish bias until I see a CLOSE below 875 on the Daily chart. New Job? Holy crap man! Congrats! I've been trying to get online but I upgrade to vista sp2 this week and its wreaked havoc on yahoo im.